Discover nine countries and many World Heritage sites as you cruise the fabled Danube River through the heartland of Central and Eastern Europe between Germany and Bulgaria, with stays in Prague and Sofia. Organization and execution of our trip with Smithsonian Journeys was excellent from first contact to farewell. Save $500 *per person on our June 2019 departures plus save $250 per person on our September 2019 dates and all our 2020 departures when you book by May 10, 2019! The fabled Danube River flows through the heartland of Central and Eastern Europe—an evocative landscape of ancient capitals, lovely villages, and magnificent churches, palaces, and castles. 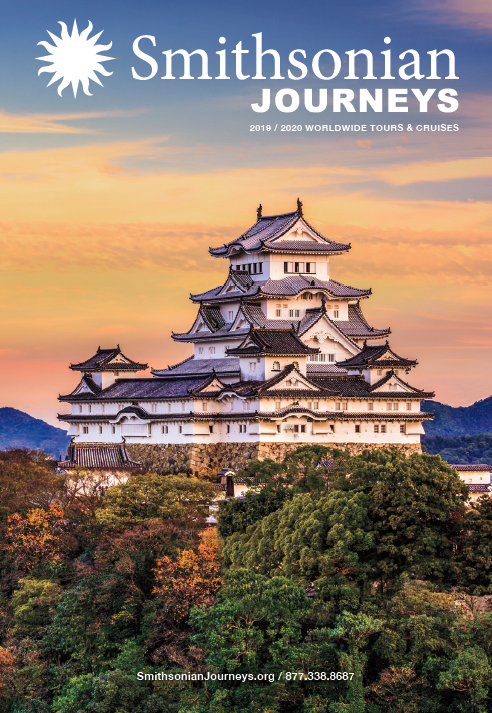 Join us for this unique itinerary that showcases nine countries and many World Heritage sites, plus features a choice of specialty excursions in many cities. Bulgaria: Explore Sofia and learn about its history and culture during a panoramic tour featuring the Royal Palace and a stroll along Vitosha Boulevard. In Vidin, visit a 17th-century church and a 19th-century synagogue. Serbia: Follow the Danube along the Serbian-Romanian border. In Belgrade, enjoy a choice of excursions featuring the Nikola Tesla Museum, a culinary tour, or a city highlights tour with a stop at Kalemegdan Park. Hungary: In Pécs, you’ll see Ottoman mosques and enjoy a wine tasting. Cruise into the heart of Budapest, one of Europe’s most striking capitals, nestled along the banks of the Danube. Visit the Grand Market, join a tour through the old Jewish Quarter, or explore both the Buda and the Pest sections of the city. Slovakia: Discover Bratislava, Slovakia’s capital and largest city. View St. Michael’s Gate and National Theater during a walking tour, enjoy an afternoon immersed in musical history, or visit the castle and Old Town. Austria and the Wachau Valley: In Vienna, tour the lavish Imperial Apartments of the Hofburg Palace, the incredible Schönbrunn Palace, or Klosterneuburg Monastery, plus enjoy an evening focused on the Viennese waltz. Then sail through the beautiful Wachau Valley, stopping at lovely Dürnstein and the Benedictine Abbey at Melk, a masterpiece of Austrian baroque architecture. Germany: Cruise to Passau, located at the confluence of three rivers—the Danube, Inn, and Ilz—and visit St. Stephen’s Cathedral, the Old Town Hall, and other sites. Czech Republic: Journey to Prague and enjoy three days in the capital of Old World Europe. Your stay features tours of Charles Bridge and the historic district; a choice of excursions, including Lobkowicz Palace, the Jewish Quarter, or Prague’s architecture; and some time at leisure. Your Elegant Small-Ship Experience: Enjoy cruising aboard an upscale small river ship that features sophisticated staterooms and public spaces, superb amenities, excellent cuisine, and an informal ambiance. Our 2019 departures will be all be aboard the Amadeus Star. For 2020 our cruise features the sister ships of Amadeus Queen (both July 2020 departures) and Amadeus Star (both the August and September 2020 departures). See more information about these ships on the Tour Details page. Please note that the direction of the cruise varies depending on departure date and is outlined under the Itinerary section below. Each voyage will also host other leading cultural and educational institutions, which will add to the excitement and energy of the experience. Depart the U.S. on an evening trans-Atlantic flight to Prague, Czech Republic. After an early morning flight arrival at Prague International Airport, clear brief arrival formalities and transfer to the luxurious and centrally located Imperial Hotel, or the InterContinental Prague (June departure). Each traveler will receive a Welcome Kit with city information and a map of Prague. After settling in, the balance of the day is free of planned activities. A full American-style buffet breakfast will be served each day in the hotel. Start exploring at the Old Town Square where you’ll see buildings in many architectural styles. Romanesque, Gothic, Renaissance and Baroque houses, palaces and churches blend to create one of the most unique city squares in Europe. See the animated Astronomical Clock that offers a performance each hour with a procession of Apostles. Personalize your Prague experience today with a choice of one of the following excursions. Spend time exploring this fascinating museum, originally a 16th-century palace located within Prague Castle. The Lobkowicz Palace and Museum offers both remarkable panoramic views of the city and a vibrant cultural experience. For 700 years, the Lobkowicz family amassed one of the most extensive collections of Czech art and cultural artifacts in Central Europe. See collection highlights with a local expert guide. This powerful experience begins as you enter the Jewish Quarter. Visit the Prague National Jewish Museum, founded in 1906. The museum endured turbulent times under both the Nazi and Communist regimes. Today, it is a remarkable showcase of Jewish history and religious treasures. The collections are housed in six synagogues, and the exhibits provide a comprehensive look at Jewish heritage in Eastern Europe. Discover the highlights of Prague’s remarkable 20th-century architecture on a walking tour with an expert local guide. Take a route through the city that focuses on Art Nouveau jewels and Cubist landmarks. There’s time to follow your own path this afternoon and explore on your own. Depart Prague for a drive through the southern Czech countryside to Passau, Germany. Approximate driving time is four hours with a rest stop en route. Situated at the confluence of three rivers; the Danube, Inn and Ilz, Passau has been called “one of the seven most beautifully situated towns in the world.” On a tour, see the Veste Oberhaus, St. Stephen’s Cathedral, the Old Town Hall, and the Niedernburg Abbey. Start the day with a visit to Melk Abbey, a masterpiece of Baroque architecture, and a World Heritage Site with remarkable views overlooking the Danube. The ship will depart Melk and sail through the spectacular Wachau Valley, considered one of the most beautiful landscapes in Europe. Admire beautiful villages clustered around charming churches and town squares. Arrive in Durnstein where there’s a choice of afternoon shore tours. Choice #1 - Richard the Lionheart was held prisoner in Durnstein in the 12th century on his way back to England from the Crusades. Visit the blue-and-white baroque Stiftskirche in this charming town known as the Pearl of the Wachau Valley. Choice #2 - Join a two-hour “bike hike” along the Danube, past local vineyards and enjoy a break for refreshments along the way. Choice #3 – On this excursion, visit a local winery and sample some of the wines of the renowned Wachau Valley. This morning, select from a menu of the following shore excursions. Choice #1 - Visit the Imperial Apartments of the ornate Hofburg Palace. Drive the Ringstrasse, and see the University, the City Hall, the Burgtheater, the Houses of Parliament, the two State Museums and the Opera House. Travel past monuments to Johann Strauss and Wolfgang Amadeus Mozart. Choice #2 - The Klosterneuburg Monastery and Wine Cellar provide remarkable examples of the Medieval and Baroque periods. After exploring the cellars, enjoy a wine tasting of the Klosterneuburg’s splendid wine. Choice #3 – Schönbrunn Palace –Marvel at Schönbrunn Palace, the remarkable summer palace and residence of the Habsburgs and a World Heritage Site. Visit its opulent State Apartments and stunning gardens. Begin the day with a talk by a local speaker focusing on The Velvet Revolution and the Making of Slovakia. Afterward, there is a choice of tours ashore. Choice #1 – Bratislava Old Town and Cafe – The city is the center and capital of the political, social and cultural life of the Slovak Republic and a showcase of fine medieval architecture. See St. Martin’s Cathedral, the National Theater, and view St. Michael's Gate, the only remaining part of Bratislava's medieval fortifications and the 16th-century Primate’s Palace, former winter residence of the Bishops of Esztergom. Stop to sample local pastry favorites with coffee or tea. Choice #2 – Bratislava Old Town and Music - Bratislava is the place the composer Hummel was born, Liszt started his career, Bartok went to school, Beethoven taught, and Haydn worked. On a special tour of the quaint Old Town center, there’s focus on the rich local musical traditions including the venues associated with these famous composers. At the end of the tour, travelers will visit a historic Rococo palace in the Old Town; now the City Gallery. There, you’ll enjoy a special concert performance. Choice #3 – Iron Curtain Bike Tour – The charming city of Bratislava straddles the Danube River. It’s the only city of the former Eastern Bloc that sat directly on the Iron Curtain. On this two-hour tour, you’ll ride along the Right Bank of the river where you’ll see historic and cultural highlights. Ride across to the Left Bank and through a venerable forest area to see a preserved World War II Bunker built for protection against the Nazis. After arrival this morning, there’s a choice of shore excursions. Choice #1 – The Best of Budapest - Budapest is one of the world's most beautiful cities in the heart of Europe and is a World Heritage Site. Travel through both the Buda and Pest sections of the city. On the excursion, see Heroes Square, the Opera House, and the famous Parliament Building. Continue to the old Castle District, with its old Matthias Church and the Fisherman's Bastion. Choice #2 – Living Local - Join a guide for a visit to the Grand Market and stop at a coffee house to see how the famous strudel is made. Enjoy a piece of delicious strudel, coffee or tea, and end your excursion with a sampling of Palinka, a local schnapps. Choice #3 – Jewish Interest Tour- This tour includes a walk through the Old Jewish Quarter. See the Great Synagogue and the Emanuel Tree. Continue to the Glass House, a place that was once a shelter and hiding-place for about 3,000 Jews saved in late 1944 and also the center of the underground Zionist organization in Hungary. See the Shoes on the Danube Memorial that remembers a place and time when Hungarian Nazis shot Jews who fell into the Danube River in the winter of 1944-45. The tour includes a visit to the Páva Street Synagogue and the Holocaust Memorial Center. This morning, travel from Mohacs to begin exploring on an excursion to Pecs. On a walking tour, see a city known for its Roman ruins and Ottoman mosques that have now been turned into Christian churches. After lunch in a local restaurant, continue to the village of Kopacevo, established in the 13th century. There, visit the Rural House that includes a presentation and short film about the area, its traditions and culture, as well as a tasting of local food specialties including Sljivovica the local fruit brandy. Travel on to Osijek, situated on the Drava River and the fourth largest town in Croatia and the region’s cultural and administrative center. During a walking tour, learn about the town’s historic past and visit the beautiful Tvrda Fortress. Choice #1 - Belgrade City Highlights - known as the White City it’s one of the oldest Eastern European capitals. The city’s signature monument is the well-preserved hillside Kalemegdan Citadel that dominates the confluence of the Danube and Sava Rivers. It is evocative of centuries of Serbian history, from Celtic times to the present day. Enjoy a panoramic drive through the main streets of Belgrade. In the Old Town, see the remarkable Church of St. Paraskeva, one of the country’s most exquisite Orthodox churches, then visit St. Sava Cathedral. Choice #2 - Belgrade: Eating Like a Local – Explore the Serbian culinary scene during a tour that showcases local culture through the “food experience.” Start with morning coffee and watch the city wake up and start moving. Try Rakija, the local brandy and along the way, learn about the customs and traditions that have influenced today’s food culture in Serbia. End the tour with a kabab of minced meat and sweet treats. Choice #3 – Science and Scientist Tour – Discover the Nikola Tesla Museum conceived as a cultural institution, to protect and honor Tesla’s life and work. The Museum also holds his remains, which makes it one of the few museums in the world which is a memorial as well as a technical institution. Start the day with a presentation by the Smithsonian Journeys Expert. The ship will follow the Danube along the Serbian-Romanian border where you’ll see dramatic landscapes and cliffs. Sail through the remarkable Iron Gate Gorge, a geological marvel where the Danube is forced through a narrowing gap and creates one of the most dramatic natural wonders in Europe. Arrive at Vidin located on the Romanian-Bulgarian border and one of the Danube’s oldest riverside towns. At an engaging talk by a local expert, learn about the conditions and events that led to the Bulgarian Revival of the 19th century when the Ottomans were defeated and expelled. Enjoy an excursion of Sofia showcasing the ancient ruins of Serdica, the St. George Rotunda, Alexander Batenberg Square with its former Royal Palace, the Patriarchal Cathedral of St. Alexander of Neva. Day 15 — Depart for U.S. Depart the U.S. on evening trans-Atlantic flights to Sofia, Bulgaria. A full American-style buffet breakfast will be served each morning in the hotel. An engaging local speaker will give a talk about the conditions and events that led to the Bulgarian Revival of the 19th. century when the Ottomans were defeated and expelled. Enjoy an excursion of Sofia showcasing the ancient ruins of Serdica, the St. George Rotunda, Alexander Batenberg Square with its former Royal Palace, the Patriarchal Cathedral of St. Alexander of Neva. Drive to the historic town of Vidin. A stop will be made en route for lunch. Vidin is located on the Romanian-Bulgarian border and is one of the Danube’s oldest riverside towns. On a tour, see the Mosque, Library of Osman Pazvantouglu, and other historic attractions. Enjoy a visit to the 17th-century St. Panteleimon Church and the 9th century Baba Vida. This morning, the ship will continue to follow the Danube along the Serbian-Romanian border where you’ll see dramatic landscapes and cliffs. Sail through the remarkable Iron Gate Gorge, a geological marvel where the Danube is forced through a narrowing gap and creates one of the most dramatic natural wonders in Europe. You’ll be invited to the Sun Deck for Früschoppen, an old German tradition of drinking beer along with pretzels, sausage with mustard. Choice #1 - Belgrade City Highlights - known as the “White City” it’s one of the oldest Eastern European capitals. The city’s signature monument is the well-preserved hillside Kalemegdan Citadel that dominates the confluence of the Danube and Sava Rivers. It is evocative of centuries of Serbian history, from Celtic times to the present day. Enjoy a drive through the main streets of Belgrade. In the Old Town, see the remarkable Church of St. Paraskeva, one of the country’s most exquisite Orthodox churches, then visit St. Sava Cathedral. During a panoramic tour of Vukovar, Croatia and see why it was known as one of the most beautiful baroque towns of the former Yugoslavia. See the historic baroque Town Center, Churches, Palaces, and Courthouse. Continue to the town of Osijek, Croatia, a noted cultural center and unique military complex at the confluence of two major rivers. Begin the day with a choice of one of the following excursions. Choice #1 – The Best of Budapest - Budapest is one of the world's most beautiful cities in the heart of Europe and is a World Heritage Site. Travel through both the Buda and Pest sections of the city. On the excursion see Heroes Square, the Opera House, and the famous Parliament Building. Continue to the old Castle District, with its old Matthias Church and the Fisherman's Bastion. Choice #3 – Budapest’s Jewish Quarter - This tour includes a walk through the Old Jewish Quarter. See the Great Synagogue and the Emanuel Tree. Continue to the Glass House, a place that was once a shelter and hiding-place for about 3,000 Jews saved in late 1944 and also the center of the underground Zionist organization in Hungary. See the Shoes on the Danube Memorial that remembers a place and time when Hungarian Nazis shot Jews who fell into the Danube River in the winter of 1944-45. The tour includes a visit to the Páva Street Synagogue and the Holocaust Memorial Center. Join fellow travelers and the Smithsonian Journeys Expert in the Travelers Corner for an informal presentation. Attend a talk by a local speaker focusing on The Velvet Revolution and the Making of Slovakia. Choice #1 – Bratislava Old Town and Cafe – The city is the center and capital of the political, social and cultural life of the Slovak Republic and a showcase of fine medieval architecture. See St. Martin’s Cathedral, the National Theater and view St. Michael's Gate, the only remaining part of Bratislava's medieval fortifications and the 16th-century Primate’s Palace, former winter residence of the Bishops of Esztergom. Stop to sample local pastry favorites with coffee or tea. Choice #2 – Bratislava Old Town and Music - Bratislava is the place the composer Hummel was born, Liszt started his career, Bartok went to school, Beethoven taught, and Haydn worked. On a special tour of the quaint Old Town center, there’s focus on the rich local musical traditions including the venues associated with these famous composers. At the end of the tour, travelers will visit a historic Rococo palace in the Old Town; now the City Gallery. There you’ll enjoy a special concert performance. Choice #3 – Iron Curtain Bike Tour – The charming city of Bratislava straddles the Danube River. It’s the only city of the former Eastern Bloc that sat directly on the Iron Curtain. On this two-hour tour, you’ll ride along the Right Bank of the river where you’ll see historic and cultural highlights. Ride across to the Left Bank and through a venerable forest area to see a preserved WWII Bunker built for protection against the Nazis. Start the day with a presentation, by a local speaker, on the relevance of Vienna over the centuries. Begin exploring with a choice of one of three tours ashore. The historic center of Vienna has been designated a World Heritage Site. Choice #2 - The Klosterneuburg Monastery and Wine Cellar provides remarkable examples of the Medieval and Baroque periods. After exploring the cellars, enjoy a wine tasting of the Klosterneuburg’s splendid wine. Durnstein is one of the most beautiful towns on the Austrian Danube, with its medieval charm and Baroque character. Start your day of discovery with a choice of excursions. Choice #3 – On this excursion, visit a local winery and sample some of the wines of the renowned Wachau Valley. After sailing from Durnstein, the ship sails through the spectacular Wachau Valley, considered one of the most beautiful landscapes in Europe and a World Heritage Site. Rising at the confluence of three rivers; the Danube, Inn and Ilz, Passau has been called “one of the seven most beautifully situated towns in the world.” See the Old Town Hall, Niedernburg Abbey, the Veste Oberhaus, and St. Stephen’s Cathedral. A full American-style buffet breakfast will be served each day in the hotel. Start exploring at the Old Town Square where you’ll see buildings in many architectural styles. Romanesque, Gothic, Renaissance and Baroque houses, palaces and churches blend to create one of the most unique city squares in Europe. Personalize your Prague Experience today with a choice of excursions. Discover the highlights of Prague’s remarkable 20th-century architecture on a walking tour with an expert local guide. Take a route through the city that focuses on Art Nouveau jewels and Cubist landmarks. Depart the U.S. on a transatlantic flight to Prague, Czech Republic. After a morning arrival at Prague International Airport, transfer to the luxurious and centrally located Art Deco Imperial Hotel. Each traveler will receive a welcome package with city information and a map of Prague. After settling in, the balance of the day is free of planned activities. Choice #1 – Lobkowicz Palace and Museum: Spend time exploring this fascinating museum, originally a 16th-century palace located within Prague Castle. The Palace and Museum offer both remarkable panoramic views of the city and vibrant cultural experience. For 700 years, the Lobkowicz family amassed one of the most extensive collections of Czech art and cultural artifacts in Central Europe. See collection highlights with a local expert guide. Choice #2 – Budapest’s Jewish Quarter: This powerful experience begins as you enter the Jewish Quarter. Visit the Prague National Jewish Museum, founded in 1906. The museum endured turbulent times under both the Nazi and Communist regimes. Today, it is a remarkable showcase of Jewish history and religious treasures. The collections are housed in six synagogues, and the exhibits provide a comprehensive look at Jewish heritage in Eastern Europe. Choice #3 – Art Nouveau and Cubist Walking Tour: Discover the highlights of Prague’s remarkable 20th-century architecture on a walking tour with an expert local guide. Take a route through the city that focuses on Art Nouveau jewels and Cubist landmarks. There’s time this afternoon to continue exploring on your own. Situated at the confluence of three rivers; the Danube, Inn and Ilz, Passau has been called “one of the seven most beautifully situated towns in the world.” Board the Amadeus Queen –July 7 departure or the Amadeus Star-August 29 departure. Have a chance to settle into your stateroom. A light lunch will be served on board. This afternoon gather for a walking tour of Passau, see the Veste Oberhaus, St. Stephen’s Cathedral, the Old Town Hall, and the Niedernburg Abbey. Choice #1 – Richard the Lionheart: Richard 1 of England was held prisoner in Durnstein in the 12th century on his way back to England from the Crusades. Visit the blue-and-white baroque Stiftskirche in this charming town known as the Pearl of the Wachau Valley. Choice #2 – Bicycle Tour: Join a two-hour “bike hike” along the Danube, past local vineyards and enjoy a break for refreshments along the way. Choice #1 – Imperial Apartments: Visit the ornate Hofburg Palace. Drive the Ringstrasse, and see the University, the City Hall, the Burgtheater, the Houses of Parliament, the two State Museums and the Opera House. Travel past monuments to Johann Strauss and Wolfgang Amadeus Mozart. Choice #2 – Klosterneuburg Monastery and Wine Cellar: Tour these fascinating wine cellars from the Medieval and Baroque periods. After exploring, enjoy a wine tasting of the Klosterneuburg’s splendid wine. Choice #3 – Schönbrunn Palace: Marvel at this remarkable summer palace and residence of the Habsburgs and a World Heritage Site. Visit the opulent State Apartments and stunning gardens. Begin the day with a talk by a local expert on The Velvet Revolution and the Making of Slovakia. Choice #1 – Bratislava Old Town and Cafe: The city is the center and capital of the political, social and cultural life of the Slovak Republic and a showcase of fine medieval architecture. See St. Martin’s Cathedral, the National Theater, and view St. Michael's Gate, the only remaining part of Bratislava's medieval fortifications and the 16th-century Primate’s Palace, former winter residence of the Bishops of Esztergom. Stop to sample local pastry favorites with coffee or tea. Choice #2 – Bratislava Old Town and Music: Bratislava is the place the composer Hummel was born, Liszt started his career, Bartok went to school, Beethoven taught, and Haydn worked. On a special tour of the quaint Old Town center, there’s focus on the rich local musical traditions including the venues associated with these famous composers. At the end of the tour, travelers will visit a historic Rococo palace in the Old Town; now the City Gallery. There, you’ll enjoy a special concert performance. Choice #3 – Iron Curtain Bike Tour: The charming city of Bratislava straddles the Danube River. It’s the only city of the former Eastern Bloc that sat directly on the Iron Curtain. On this two-hour tour, you’ll ride along the Right Bank of the river where you’ll see historic and cultural highlights. Ride across to the Left Bank and through a venerable forest area to see a preserved World War II Bunker built for protection against the Nazis. Today, arrive in the stunning city of Budapest where you’ll have your choice among excursions. Choice #1 – The Best of Budapest: Budapest is one of the world's most beautiful cities and is a World Heritage Site. Travel through both the Buda and Pest sections of the city. On the excursion, see Heroes Square, the Opera House, and the famous Parliament Building. Continue to the old Castle District, with its old Matthias Church and the Fisherman's Bastion. Choice #2 – Living Local: Join a guide for a visit to the Grand Market and stop at a coffee house to see how the famous strudel is made. Enjoy a piece of delicious strudel, coffee or tea, and end your excursion with a sampling of Palinka, a local schnapps. Choice #3 – Jewish Interest Tour: This tour includes a walk through the Old Jewish Quarter. See the Great Synagogue and the Emanuel Tree. Continue to the Glass House, a place that was once a shelter and hiding-place for about 3,000 Jews saved in late 1944 and also the center of the underground Zionist organization in Hungary. See the Shoes on the Danube Memorial that remembers a place and time when Hungarian Nazis shot Jews who fell into the Danube River in the winter of 1944-45. The tour includes a visit to the Páva Street Synagogue and the Holocaust Memorial Center. This morning, disembark the ship for a full day excursion where you first travel from Mohacs on an excursion to Pecs. During your walking tour, see a city known for its Roman ruins and Ottoman mosques that have now been turned into Christian churches. After lunch in a local restaurant, continue on to the village of Kopacevo, established in the 13th century. There, visit the Rural House that includes a presentation and short film about the area, its traditions, and culture, as well as a tasting of local food specialties including Sljivovica the local fruit brandy. Travel on to Osijek, situated on the Drava River and the fourth largest town in Croatia and the region’s cultural and administrative center. During a walking tour, learn about the town’s historic past and visit the beautiful Tvrda Fortress. Begin the day with a presentation by a local expert who will discuss the state of modern Serbia. Later, you’ll have a choice of included shore excursions. Choice #1 - Belgrade City Highlights: Known as the White City it’s one of the oldest Eastern European capitals. The city’s signature monument is the well-preserved hillside Kalemegdan Citadel that dominates the confluence of the Danube and Sava Rivers. It is evocative of centuries of Serbian history, from Celtic times to the present day. Enjoy a panoramic drive through the main streets of Belgrade. In the Old Town, see the remarkable Church of St. Paraskeva, one of the country’s most exquisite Orthodox churches, then visit St. Sava Cathedral. Choice #2 - Eating Like a Local: Explore the Serbian culinary scene during a tour that showcases local culture through the “food experience.” Start with morning coffee and watch the city wake up and start moving. Try Rakija, the local brandy and along the way, learn about the customs and traditions that have influenced today’s food culture in Serbia. End the tour with a kabab of minced meat and sweet treats. Choice #3 – Science and Scientist Tour: Discover the Nikola Tesla Museum conceived as a cultural institution, to protect and honor Tesla’s life and work. The Museum also holds his remains, which makes it one of the few museums in the world which is a memorial as well as a technical institution. Start the day with a presentation by the Smithsonian Journeys Expert. The ship will follow the Danube along the Serbian-Romanian border where you’ll see dramatic landscapes and cliffs. Sail through the remarkable Iron Gate Gorge, a geological marvel where the Danube is forced through a narrowing gap and creates one of the most dramatic natural wonders in Europe. Enjoy an excursion to explore Sofia, see the ancient ruins of Serdica, the St. George Rotunda, Alexander Batenberg Square with its former Royal Palace, the Patriarchal Cathedral of St. Alexander of Neva. Depart the U.S. on a transatlantic flights to Sofia, Bulgaria. A full American-style buffet breakfast will be served each morning in the hotel. A local expert will give a talk about the conditions and events that led to the Bulgarian Revival of the 19th. century when the Ottomans were defeated and expelled. Enjoy exploring Sofia’s ancient ruins of Serdica, the St. George Rotunda, Alexander Batenberg Square with its former Royal Palace, the Patriarchal Cathedral of St. Alexander of Neva. Depart Sofia by motor coach for the historic town of Vidin. A stop will be made en route for lunch. Vidin is located on the Romanian-Bulgarian border and is one of the Danube’s oldest riverside towns. See the Mosque, Library of Osman Pazvantouglu, and other historic attractions. Enjoy a visit to the 17th-century St. Panteleimon Church and the 9th century Baba Vida. Begin the day with a presentation on present-day life in the former Yugoslavian state of Serbia. You’ll then have your choice of included excursions. Choice #1 - Belgrade City Highlights: Known as the “White City” Belgrade is one of the oldest Eastern European capitals. The city’s signature monument is the well-preserved hillside Kalemegdan Citadel that dominates the confluence of the Danube and Sava Rivers. It is evocative of centuries of Serbian history, from Celtic times to the present day. Enjoy a drive through the main streets of Belgrade. In the Old Town, see the remarkable Church of St. Paraskeva, one of the country’s most exquisite Orthodox churches, then visit St. Sava Cathedral. Today arrive in the stunning city of Budapest. You’ll enjoy your choice of one of the following included excursions. Choice #1 – The Best of Budapest: Budapest is one of the world's most beautiful cities and is a World Heritage Site. Travel through both the Buda and Pest sections of the city. On the excursion see Heroes Square, the Opera House, and the famous Parliament Building. Continue to the old Castle District, with its old Matthias Church and the Fisherman's Bastion. Choice #3 – Budapest’s Jewish Quarter: This tour includes a walk through the Old Jewish Quarter. See the Great Synagogue and the Emanuel Tree. Continue to the Glass House, a place that was once a shelter and hiding-place for about 3,000 Jews saved in late 1944 and also the center of the underground Zionist organization in Hungary. See the Shoes on the Danube Memorial that remembers a place and time when Hungarian Nazis shot Jews who fell into the Danube River in the winter of 1944-45. The tour includes a visit to the Páva Street Synagogue and the Holocaust Memorial Center. Join fellow travelers in the Smithsonian Journeys Travelers’ Corner for an informal presentation. Then gather for a presentation by a local speaker on The Velvet Revolution and the Making of Slovakia. Later this morning enjoy your choice of included excursions. Choice #1 – Bratislava Old Town and Cafe: The city is the center and capital of the political, social and cultural life of the Slovak Republic and a showcase of fine medieval architecture. See St. Martin’s Cathedral, the National Theater and view St. Michael's Gate, the only remaining part of Bratislava's medieval fortifications and the 16th-century Primate’s Palace, former winter residence of the Bishops of Esztergom. Stop to sample local pastry favorites with coffee or tea. Choice #2 – Bratislava Old Town and Music: Bratislava is the place the composer Hummel was born, Liszt started his career, Bartok went to school, Beethoven taught, and Haydn worked. On a special tour of the quaint Old Town center, there’s focus on the rich local musical traditions including the venues associated with these famous composers. At the end of the tour, travelers will visit a historic Rococo palace in the Old Town; now the City Gallery. There you’ll enjoy a special concert performance. Choice #3 – Bike Tour: The charming city of Bratislava straddles the Danube River. It’s the only city of the former Eastern Bloc that sat directly on the Iron Curtain. On this two-hour tour, you’ll ride along the Right Bank of the river where you’ll see historic and cultural highlights. Ride across to the Left Bank and through a venerable forest area to see a preserved WWII Bunker built for protection against the Nazis. This morning a local expert joins the group for a presentation on Timeless Vienna. You’ll then have a choice of one of the included excursions. Choice #1 - Imperial Apartments: Visit the ornate Hofburg Palace. Drive the Ringstrasse, and see the University, the City Hall, the Burgtheater, the Houses of Parliament, the two State Museums and the Opera House. Travel past monuments to Johann Strauss and Wolfgang Amadeus Mozart. Choice #2 - Klosterneuburg Monastery and Wine Cellar: Tour these fascinating wine cellars from the Medieval and Baroque periods. After exploring, enjoy a wine tasting of the Klosterneuburg’s splendid wine. Choice #3 – Schönbrunn Palace: Marvel at this remarkable summer palace and residence of the Habsburgs and a World Heritage Site. Visit its opulent State Apartments and stunning gardens. Durnstein is one of the most beautiful towns on the Austrian Danube, with its medieval charm and Baroque character. This morning you’ll have a choice of included excursions. Choice #1 - Richard the Lionheart: Richard 1 of England was held prisoner in Durnstein in the 12th century on his way back to England from the Crusades. Visit the blue-and-white baroque Stiftskirche in this charming town known as the Pearl of the Wachau Valley. Choice #3 – Wine Tour: On this excursion, visit a local winery and sample some of the wines of the renowned Wachau Valley. From Durnstein, the ship sails through the spectacular Wachau Valley considered one of the most beautiful landscapes in Europe and a World Heritage Site. Rising at the confluence of three rivers; the Danube, Inn and Ilz, Passau has been called “one of the seven most beautifully situated towns in the world.” Depart the ship on a walking tour of Old Town Hall, Niedernburg Abbey, the Veste Oberhaus, and St. Stephen’s Cathedral. Experience the city with your choice of one of the included excursions. Choice #1 – Lobkowicz Palace and Museum: Spend time exploring this fascinating museum, originally a 16th-century palace located within Prague Castle. The Lobkowicz palace and museum offer both remarkable panoramic views of the city and vibrant cultural experience. For 700 years, the Lobkowicz family amassed one of the most extensive collections of Czech art and cultural artifacts in Central Europe. See collection highlights with a local expert guide. Choice #2 – Prague’s Jewish Quarter: This powerful experience begins as you enter the Jewish Quarter. Visit the Prague National Jewish Museum, founded in 1906. The museum endured turbulent times under both the Nazi and Communist regimes. Today, it is a remarkable showcase of Jewish history and religious treasures. The collections are housed in six synagogues, and the exhibits provide a comprehensive look at Jewish heritage in Eastern Europe. Choice #3 – Art Nouveau and Cubist Walking Tour: Discover the highlights of Prague’s remarkable 20th-century architecture on a walking tour with an expert local guide. Take a route through the city that focuses on Art Nouveau jewels and Cubist landmarks.